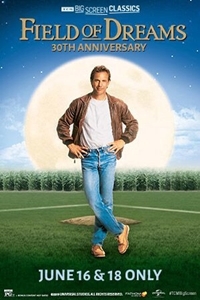 Fathom Events, TCM and Universal Pictures present Field of Dreams, returning to cinemas for a special 30th anniversary event. "If you build it, he will come." With these words, Iowa farmer Ray Kinsella (Kevin Costner) is inspired by a voice he can't ignore to pursue a dream he can hardly believe. Supported by his wife Annie (Amy Madigan), Ray begins the quest by turning his ordinary cornfield into a place where dreams can come true. A heartwarming experience that has moved critics and audiences like no other film of this generation, Field of Dreams is a glowing tribute to all who dare to dream. This two-day event includes exclusive insight from Turner Classic Movies.